Yeshe Tsogyal banner, which now hangs in many of our shrinerooms. Yeshe Tsogyal has long been a key figure in the Nyingma lineage, important to the Vidyadhara and the Sakyong. In the “Supplication to the Shambhala Lineage,” she is paired with “Lotus-born Padmakara” as “Wisdom Yeshe Tsogyal.” Her name means literally “wisdom ocean queen,” and her blessing is associated with the development of genuine nondual wisdom in our practice. She is also supplicated in a chant composed by the Fifteenth Karmapa that is sometimes done just after the Seven-Line Supplication in Vajrayana practice. This Yeshe Tsogyal chants serves as a complement to the chant to Guru Rinpoche in seven lines, for it expresses the aspects of wisdom, protection, and nurture associated with the indestructible realization of Guru Rinpoche, the father of Tibetan Buddhism. The Yeshe Tsogyal chant appears as part of the Rain of Blessings practice. Yeshe Tsogyal, we supplicate at your feet. Grant your blessings so that outer, inner, and secret obstacles may be pacified. Grant your blessings so that the lives of the gurus may be long. Grant your blessings so that this kalpa of disease, famine, and war may be pacified. Grant your blessings so that the casting of curses, spells, and sorcery may be pacified. Grant your blessings so that life, glory, and prajña¥ may increase. Grant your blessings so that our wishes may be fulfilled spontaneously. This was written by Khakhyap Dorje [Karmapa XV], the boy nurtured by the jñanadakinis. May virtue and goodness increase! Translated by the Vajravairochana Translation Committee, used with permission. This chant clarifies Yeshe Tsogyal’s importance for especially the Dzogchen lineage of Samantabhadra, the primordial Buddha of the Nyingma. First, she is called “mother of all the victorious ones,” the buddhas of the three times, which is also an epithet for the Prajnaparamita, the “wisdom-gone-beyond” in the sutra tradition. She is the mother because it is through realizing our wisdom-minds that we and all sentient beings will become buddhas. Next, she is called Samantabhadri, the feminine aspect the primordial Buddha of the Nyingma, Samantabhadra, also known as the All-Good One; therefore, she is the feminine aspect of basic goodness. She is called “very kind” for she is the nurturer of Tibetan Buddhist practitioners. As a wisdom-dakini, it is she who bestows the supreme siddhi of enlightenment. She is the queen of all “great-bliss” dakinis, those who awaken our most intimate experience of wisdom of bliss and emptiness, the highest realization of meditation. 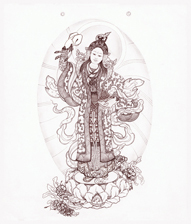 The Vajrayana practitioner asks for Yeshe Tsogyal’s blessings in six areas of support. First, she is supplicated so that obstacles in our lives, practice, and minds may be removed or disarmed. She is asked to support the long lives of our teachers, upon whom we rely for instruction, guidance, and blessings. She is asked to mitigate the forces of setting-sun world—both the dark age of “disease, famine and war” and the human karma of struggle that expresses itself as “curses, spells, and sorcery.” She is asked to nurture the blossoming of long life, the glory, and the prajna, or penetrating insight, of all beings. Lastly, she is asked to fulfill the dharmic wishes of all practitioners. According to all Tibetan stories about her, Yeshe Tsogyal was an historical woman who lived in Tibet in the eighth century. Like the historical Buddha Sakyamuni, she had a human conception, birth, life and death, and became enlightened in a single lifetime. As princess of the kingdom of Karchen, she married the king of Tibet, Trisong Detsen, and became one of his queens. Her spiritual teacher was Padmasambhava, or Guru Rinpoche, who is always credited with having a pivotal role in the transmission of Buddhism to Tibet. She was his most important student, and after his death she propagated the Vajrayana teachings throughout Tibet, and so was an important teacher in her own right, indispensable to Guru Rinpoche’s work and success. As an historical, real woman, Yeshe Tsogyal is important as an enlightened role model for women in a context that often seems lacking in female role models. Yeshe Tsogyal was chosen by the Sakyong precisely because she was a real Tibetan woman, rather than an abstract non-human symbol like Tara or Prajnaparamita. According to the Nyingma accounts, Yeshe Tsogyal achieved buddhahood, the immortality of the vajra body, and continues to come in visions to those of pure aspiration. Inseparable from her humanity is Yeshe Tsogyal as manifestation of the feminine principle–experiential nondual wisdom that takes female form (as well as male form) when it is represented symbolically. This means that the historical Yeshe Tsogyal is also an emanation of the enlightened feminine principle in much the same way that Guru Rinpoche is the emanation of the enlightened masculine principle. Feminine wisdom and masculine skillful means are the two axes of enlightened mind—wisdom without skillful means is ineffectual, and means without wisdom is not skillful. Only when each has been cultivated in our practice and the two are experienced in union, inseparably, can our enlightenment blossom. In her story and symbolism, these two aspects of her being, as historic human being and as manifestation of the Buddha’s three-fold manifestation (trikaya) are always intricately interwoven. Telling one side of the story without the other distorts the story. For example, the story of her conception and birth is told twice, once for her as manifestation of the feminine principle, and once recounting her human parents and their conception of her. As both an ordinary human being and a manifestation of the Buddha’s three-fold manifestation, Yeshe Tsogyal is no different in her makeup from us, except that she has recognized her inherent nature more completely. In this way also, she is our role model and guide. As the feminine wisdom aspect of the lineage, she has also taken the role of protector of the wisdom journey of the Vajrayana practitioner. As such, she and her retinue ensure the integrity of the teachings, the teacher, the students, the time and the place of Vajrayana practice and transmission. It is her responsibility to guarantee the proper continuation of the teachings, and of the community of practitioners. This is why the Vajrayana student asks for her blessings in a prayer. Is the story of Yeshe Tsogyal true? Western historians of Tibetan Buddhism do not mention Yeshe Tsogyal in their accounts of the introduction of Buddhism to Tibet because they regard her as a legendary figure. Most western students of Tibetan Buddhism are much more aware of Guru Rinpoche’s story than they are of the accounts of Yeshe Tsogyal. However, Tibetans themselves treasure her story–they regard Guru Rinpoche without Yeshe Tsogyal as incomplete, just as the masculine principle is incomplete without the feminine principle. She was essential to his full manifestation as a Vajrayana teacher, to his Buddha activity, to his creation of the collection of termas or hidden treasure teachings, and to his effective subjugation of obstacles to dharma practice. As practitioners, we would do well to take Tibetan sensibilities as a model for ourselves. Even if Yeshe Tsogyal’s life were not established historically, we still must tell her story because Guru Rinpoche’s life and activity would be incomplete without her. This article is an excerpt from the primer Introducing the YESHE TSOGYAL BANNER, which is offered on www.shambhala.org as a guide to conducting a feminine principle event at your local centre. Click here to read the primer in full. Viendra voler dans ton voile et lui , lui te reconnaitra . Thankyou Rita and Judith. perfect timing!